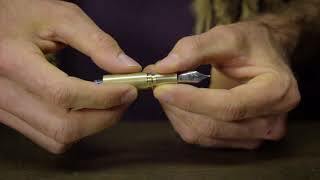 There are several possibilities to screw this pen together, for example the short version without cap and connecting piece, or the long version with connecting piece and cap. Therefore this fountain pen´s weight and length can be adjusted to meet the individual needs of its user. The minimalistic design is reminiscent of Bauhaus and Braun.